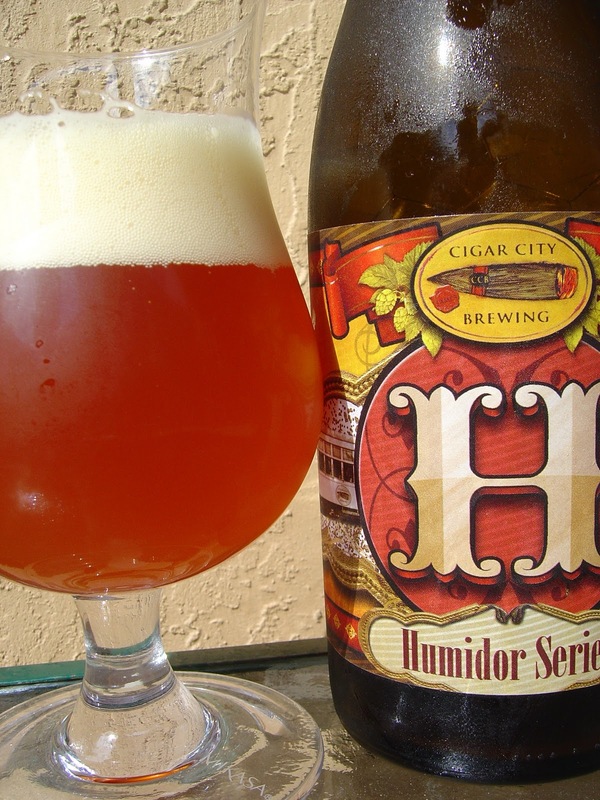 This afternoon I'm drinking Humidor Series India Pale Ale brewed by Cigar City Brewing in Tampa, Florida. I recently enjoyed Cigar City's Jai Alai IPA and was wondering if this is that beer, just with the Cedar aging, or some other IPA. The bottle and their website do not indicate that to be the case, but after three or four other much bigger beer geeks and journalists confirmed that to be the case, I am a believer. After all, Cigar City hasn't even bothered to update their new label on their website! Hey, Joey, I'd be happy to be your official photographer. Just give me a jingle! Let's see. Nice wine-bottle presentation as usual. 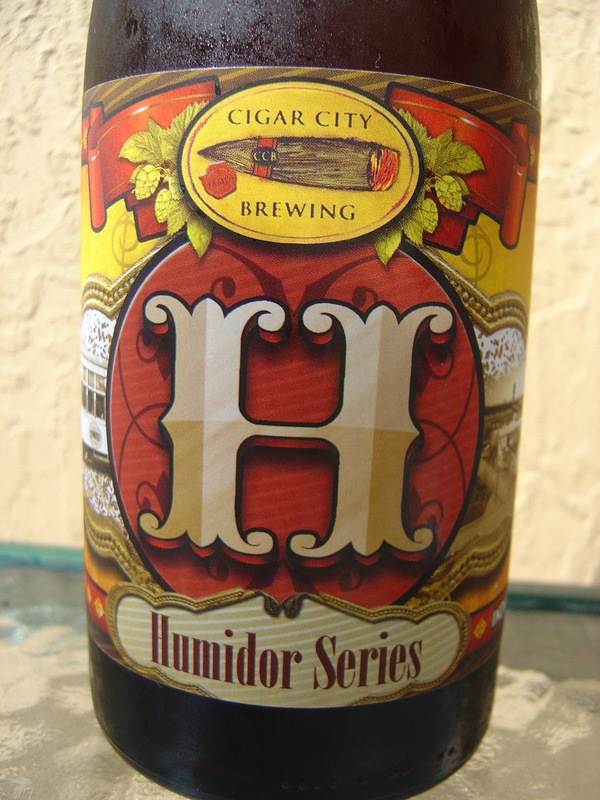 As I mentioned above, this is a new label for their Humidor Series of beers, with a big and decorative "H" in front of an old-time Tampa scene. This Series ages their beers on Spanish Cedar, rotating which one is next for the "cigar box" treatment. Malty aroma, grass and soft wood. Not a very powerful aroma, though it does get a little more tropical and fruity as it reaches room temperature. Bitter lemon and grapefruit flavors power the beginning. A definite Cedar component is right there. "But how do you know how Cedar smells and tastes?" Excellent question. The house I grew up in had a Cedar Closet in it for my mother's wardrobe. We called it the "Cedar Closet" and it had an incredibly distinct smell that I will never forget despite not being there for 20 years. Oh and those Cedar blocks and hangars used to keep the insects away, well, I've crossed paths with them as well--stupid ex-girlfriends. Next flavors include pine and some black pepper spice. A sharp little alcohol bite also works with the medium plus carbonation to make sure you're paying attention. More citrus, more wood. Very lemony and more closet. My buddy Mike from MikeLovesBeer said that the Cedar used to be "in your face" in previous editions of this beer. Personally, not being a (beer) wood guy, I like the subtlety presented here and think there are plenty of Cedar characteristics. And I like the Cedar more than other woods. Warmth brings slightly more tropical flavors as well, but in the end, this is Jai Alai dressed in Cedar, nothing more. I really enjoyed Jai Alai, and think this twist is interesting and worthy of a try. The price of this Humidor beer is significantly more considering I can buy a six pack of normal Jai Alai for $10 or this wine bottle for the same price, but OK, once in a while. Update 10/18/2010: Here is a "question" and "answer" exchange from Twitter today that might explain the lack of Cedar flavor that Mike mentioned above. "Brewkkake" is the same Joel that commented already below. Oh, and he is ALWAYS tactful! CigarCityBeer @Brewkkake The company switched wood thickness which effected pitch size and we didn't adjust. It was 1 batch and corrected. CedarAmerica Cedar Hang Ups 8 pk. You have me looking for this now! Good review! I love stopping by here. My primordial beer knowledge lessens daily. And I might just snag a set of cedar hang-ups as well. Cheers. Hey Mike. This one is pretty good. If you are not aware, Tampa has this All Star brewery called Cigar City. Everyone in this area has this slobbering love affair with them, and it's worse nationally as they are very tiny and no one else can get their beers. Personally, it's crazy ridiculous. But if you are looking to adopt, a case of this beer might put you on the right track. It. Is. That. Hyped. Love having you stop by. Brooklyn Black Chocolate Stout is next! I tried mine last night as well and definitely don't get as much of the Spanish cedar as the bottle I had with the older label. In fact, this newer bottle wasn't all that great for me and I spilled out the last 6 ounces or so (Blasphemy. Yes, I know). Cigar City reigns supreme but there was something off with this one. Plus, it wrecked my stomach afterward and I passed on dinner and any more beer. Sorry to hear that, Joel. Actually, I meant to write that I actually enjoyed the second half more, after it warmed up a bit. A little more tropical and sweeter fruitiness.